THE PENULTIMATE round of the South Australian National Football League (SANFL) Women’s season is here, with finals spots up for grabs as five teams fight for four spots, and wins for West Adelaide and Glenelg in particular become of the upmost importance. The Roosters have been in ripping form of late and after a slow start to the year which saw North Adelaide start 1-3, last year’s minor premiers have strung four games on the trot to not only all but guarantee a finals spot, but keep the heat on second placed South Adelaide who are just one win ahead. For Central District, their finals dream was doused last week, but there is still plenty of pride in performance on the line as the Bulldogs look to leapforg Sturt into sixth place if they can muster an unlikely away win. North have brought back Melbourne AFL Women’s player Ashleigh Woodland who has returned to the half-back flank alongside Amber Ward and the duo will no doubt make it hard for the Bulldogs to score. The Roosters have lost Paige Allen to a hamstring, while winger Erica Greet also comes into the side among three changes. The Bulldogs have named an extended bench which includes Taryn Wills and Shannen Solly who return to the side, while the Bulldogs were forced to make a change with their half-back general, Gemma Doughty out of the team with a knee injury. The Bulldogs will look to Katelyn Rosenzweig up forward, while Chantelle Reynolds and Abbey Scheer are among the consistent performers thus far, while sisters, Jayme-Lee Sonneman and Demi Sonneman have been crucial cogs since coming into the club this season. For North, they have the dominant Kelly Barltrop who leads all-comers in the goalkicking and beside her is Brittany Perry and Cristie Castle who are potent in attack, while Nadia Von Bertouch has enjoyed her time at half-forward leading the troops, with Jane Altschwager dominant in the ruck and Leah Tynan consistent in midfield. With a strong line-up across the park, North should get the job done here, while Central will miss Doughty who has been an important player in their side. West Adelaide hold the coveted fourth spot in the SANFL Women’s competition with Glenelg biting at the Bloods’ heels to sneak into the final four. The Bloods face the winless Woodville-West Torrens Eagles in this clash and will be keen to take the points and set up a huge final round. Youngster Jaimi Tabb has returned for the Eagles to join Kiana Lee in the forward line with the midfielder Tabb looking to add extra firepower up front. Jess Wilson also comes into the forward line amongst at least four changes for the underdog, with Annastasia Falkenberg forced out of the team due to a finger injury. The Eagles have some good developing talent in the team, but have not been able to sustain their intensity for four quarters, with blow-outs often not reflective of the effort, more lapses in play. Natalie Subelli and Natasha Farrier will hope to win the midfield battle, while Stephanie Walker and Tesharna Maher will hope to provide some good movement out of defence. Chelsea Biddell and Melanie Elsegood are a dominant key forward duo, and the likes of Ashlee Reid and Colbie Frankland could have their work cut out for them. For West Adelaide, Kasia Culhane will miss after a great 18-disposal, five-clearance game last week; she has succumbed to a shoulder injury. The big return – both literally and metaphorically – for the the home side is Leah Swain who will be an important presence in the ruck. She, along with Alexandra Mason in the forward pocket, join five potential inclusions on an extended interchange bench. Maddie Newman is the one to watch in defence, sure to rebound time and time again, while through the midfield, Rachelle Martin and Abbie Ballard lead an underrated group who can match it with most sides. West Adelaide have much more to play for and should grab the points in this one, although the Eagle could enjoy spoiling the finals party for their opponents. The inclusion of the round, and arguably the season by far is that of Ebony Marinoff, the Adelaide Crows’ star onballer who slots into the Glenelg midfield for her first local game in a few years. Marinoff supported the Tigers growing up and now will run out for Glenelg at home as they try and keep in touch with West Adelaide in the penultimate round. She is joined by ruck, Rhiley Ritchie and Hannah Crump in the side, while Sturt have opted for an unchanged line-up for this game. Sturt’s season unofficially came to an end last week when its hopes for finals were dashed. A win here and the Double Blues can dash those of Glenelg fans too. It will be more than a tough ask for the visitors, with Georgia Bevan, Maya Rigter and Caitlyn Swanson a strong trio onball, but coming up against Marinoff will make the Tigers hard to combat. Throw in the likes of Ellen Fauser and Charlotte Dawe and the Tigers are still solid through midfield. Glenelg is one of the teams which does not have a particular strength, rather relying on efforts across the ground with Tess Morcom and Samantha Franson making a consistent key defensive duo, Lucy Bellinger providing the firepower up forward, and Madisyn Freeman and crucial key position player, Caitlin Gould also have great seasons. All eyes will be on Marinoff given the midfielder had the most touches at AFL Women’s level in a game this season, so seeing what she could do at state level will be reminiscent of the time Nathan Buckley suited up for Williamstown and packed out the stadium – hopefully we see the same at ACH Group Stadium. The Double Blues have a strong midfield, while Alex Ballard has been a talent in defence, and Georgia Swan and Nicole Baker good in the forward half. If they can win the midfield battle while controlling Marinoff, the Double Blues are a solid chance, but like West Adelaide in the previous game, Glenelg have a lot more at stake and should grab the points. The final game of the round and standalone match is that of the top two sides going head-to-head in what could be a Grand Final preview. Last year’s premiers host last year’s grand finalists in what is shaping up to be a sensational clash. Both teams have taken different approaches to their team selection, with South Adelaide making at least seven changes compared to Norwood’s one confirmed change. Both have crucial players returning, with ball-winner and Adelaide Crows midfielder, Nikki Gore coming into the Panthers line-up alongside Mykala Walker-Murphy who booted a bag of four goals earlier in the season. Also returning to the Panthers are defenders Emily Brockhurst and Tiffany Copley, while Rhiannon Busch comes into the fold for Norwood, as does recently departed Crow, Sally Riley. The Panthers will be smiting at their second defeat of the season last weekend when they went down to Glenelg having defeated them a week earlier, while the Redlegs are yet to taste defeat and will look to secure top spot with a victory here. Norwood won the clash between the powerhouses in Round 1, and have had such a settled team throughout the season. Their midfield is the best in the competition, and the inclusion of Riley allows Ellen Maple Medallist Najwa Allen to play forward which is a fantastic luxury to have. Add in Matilda Zander and Hannah Priest in attack, and the defensive rebound duo of Sophie Armitstead and Monique Hollick in defence, and the Redlegs are covered at both ends. Leah Cutting provides first use to her midfielders including Busch and Hannah Dunn, but she will have to contend with the athletic, Montana McKinnon who is a terrific emerging talent. Their young and talented midfield at South Adelaide include Hannah Munyard and Teah Charlton who get forward and apply scoreboard pressure, while Czenya Cavouras, Elyse Haussen and Nicole Campbell make the Panthers have the best depth of anyone in the competition. Basically, the best top-end midfield going against the deepest midfield makes for a fascinating contest. Norwood deservedly go in as favourites for this game, while South Adelaide would have geared itself up for this match as both sides look to go deep in finals. With North Adelaide breathing down the Panthers’ necks, South will hope to get the job done and secure second spot. THE top four sides face off against the bottom four sides this round in the South Australian National Football League (SANFL) Women’s competition, in a week where finals can just about be locked in. Norwood is secure, South Adelaide is all but in barring a catastrophic end to the season, and North Adelaide has a soft run home. For West Adelaide, Round 8 provides a chance to get breathing space on Glenelg, while for Sturt and Central District, there are no second chances in the final few rounds. Woodville-West Torrens is still searching for its first win and will be hoping to upset North Adelaide this weekend. The top-of-the-table Norwood travel to Peter Motley Oval to take on Sturt, which experienced its best win of the season last week, running over the top of Woodville-West Torrens to keep the Double Blues faint finals hopes alive. Unfortunately for the underdogs, a loss here and it is curtains on season 2019. West Adelaide is eight points clear in fourth, and playing Central District, with a win to the Westies making it impossible for Sturt to make it if the Double Blues lose, while even if they win, they need to hope their rivals do not pick up another win. To Sturt’s credit, they have headed in keeping the same team that found winning formula, with Zoe Prowse and Lilla Berry both added to the side. For the Redlegs, they have lost three players through injury and suspension, with Rhiannon Busch (suspended), and Jane Fitzgerald and Elisha Gallagher (both injured). Into the team comes seven players on an extended interchange bench, with Jo Hill named at centre half-back, while Ellen D’Alessandro is in the back six, while Kate Fenton and Cassie Tsoumbris have been added to the midfield rotation. Norwood’s midfield is the most superior in the competition, and along with South Adelaide’s, knows how to just get the job done when down. Najwa Allen has leather poisoning most weeks, and has been named at centre half-forward in Round 8, while Hannah Dunn and Matilda Zander will be crucial rovers to Leah Cutting who is enjoying a good season. luckily for Sturt, the midfield is where the Double Blues also hold plenty of cards, with clearance gem, Georgia Bevan, Maya Rigter and Caitlyn Swanson all capable of winning the ball then going forward and creating scoring opportunities. Alex Ballard will provide run out of defence, while Monique Hollick and Sophie Armitstead will do the same for Norwood.The Redlegs are heavy favourites in this clash and it is hard to see an upset given the depth of the team across the field, but if Sturt can get a fast start, and follow up its work from the week before, anything is possible. There will be a sense of deja vu when these sides meet on Saturday evening, having played at the same venue against each other just a week earlier. In that game, South Adelaide were too good, coming away with a 28-point win over the Tigers. From last week, the Tigers have gone in adding potential goalkicking forward, Hannah Crump, and Chelsea Packer to their side, while the Panthers have welcomed back Montana McKinnon after missing due to AFL Women’s Academy duties. They have also added Stacey Huddleston to the starting 18, named in the back pocket alongside the reliable Jaslynne Smith. There is no surprise that South Adelaide will be favourites in this game, having not lost since Round 1 and looking every bit the main challenger to Norwood. The midfield of Hannah Munyard, Czenya Cavouras, Nicole Campbell and Elyse Haussen is as good as any, while McKinnon and Teah Charlton add youthful excitement inside 50. Mykala Walker-Murphy has stood up in recent weeks, and with Cheyenne Hammond patrolling the backline, the Panthers have talent across the field. Glenelg is also capable to causing an upset, but unlike the Panthers, come into the game desperate to get out of a run, having lost five games on the trot since bursting out of the blocks with three wins. Lucy Bellinger looms as the danger for the Panthers with the Tigers sharpshooter able to hit the scoreboard and set up her teammates. Ellen Fauser through the middle with Cassie Hartley will no doubt find plenty of the ball, while Tess Morcom and Sam Franson provide good strength and stability in the back half. They will need some luck, and plenty of direct football to topple the mighty Panthers who have one eye on the finals, but Glenelg’s finals hopes are fading, and a loss here would almost certainly spell the end for season 2019 after a promising start. Meanwhile a win for South Adelaide guarantees the Panthers a top two spot. While the Tigers/Panthers game has serious finals ramifications, spare a thought for the Bulldogs/Bloods match which will ultimately decide more than one team’s fate this season. If West Adelaide gets up as one would expect the Bloods to, they are all but booked into finals unless Glenelg upsets South Adelaide, and in the process, slamming the door shut on both Sturt and Central District in season 2019. West Adelaide can still grab third too as the Bloods are equal with North Adelaide on points despite a loss to them last week. Given the Roosters face the three bottom teams over the three rounds, this is simply a must-win for the Westies, who while facing the two bottom sides, also have a date with South Adelaide in the final round. But keeping it simple, a win should be enough to book a finals spot. Both sides have opted for a number of changes, and Central District brings back some serious talent with full-forward Katelyn Rosenzweig and captain Nicola Biagi back into the line-up. For the Bloods, Rachelle Martin returns and is a massive inclusion to the on-ball brigade. Chelsea Biddell was quiet last week with just seven touches and three marks, and one can expect a dominant goalscorer to not stay down for too long. She looms as a massive task for the Central District defence, while Niamh Davis could be the one tasked with restricting Rosenzweig who while inaccurate, often finds plenty of opportunities inside 50. Kimberley Fry at full-back will steady the Bulldogs, while Jayme-Lee Sonneman and Demi Sonneman were terrific last week despite the loss, as was Gemma Doughty who has been a ray of consistency off the half-back flank. For West Adelaide, Abbie Ballard will be excited to have Martin back in the midfield mix, while Maddie Newman continues to just find the ball and perform. Helen Maidment is an underrated played in the Bloods line-up, while Melanie Elsegood is also capable of finding the big sticks with a goal a game so far this season. West Adelaide are favourites, but this is expected to be the closest game of the round, so tune in to see two teams battling to keep their seasons alive. In the final game of the round, the struggling Eagles take on a reborn North Adelaide outfit at Maughan Thiem Oval. The Eagles are yet to win a game in their debut season, while the Roosters are starting to click into gear at the right time of the season. They looked shaky early on against the top sides, and dropped a game to Glenelg as well, but now they have their sights firmly focused on finals. While top two is realistically out of reach, another win will book their spot in the top four given their superior percentage to rivals. With the bottom three sides in the final three rounds, the Roosters could take full advantage of the draw and gather percentage and momentum heading into finals. North Adelaide has made two changes to the line-up with Alex Fittridge and AFL Women’s player, Brittany Perry returning to the line-up, while last week’s top disposal winner, Erica Greet is unavailable, as is Sarah Ellis. After spending most of the season through the midfield, captain Nadia Von Bertouch has been named at half-forward, and with Emma Sampson, Cristie Castle and of course competition leading goalkicker, Kelly Barltrop all in the forward 50, it makes the Roosters front half the most damaging in the league. Their midfield also has plenty of runs on the board with Paige Allen and Leah Tynan, while Jane Altschwager is among the best rucks in the competition, and Amber Ward is a rebounding machine at half-back. There are not too many weaknesses in the North Adelaide line-up and if you were up for backing a roughie in the competition, the Roosters are the perfect side to turn to now they are hitting their straps. Their opponents are the Eagles who have also made at least three changes, with Jaimi Tabb a notable inclusion to the side. They have had fast starts in recent times, but have struggled to go on with it, as Kiana Lee has been the key goalkicker inside 50. Georgia Taylor has been named at half-forward after starting the season in defence, while Natasha Farrier will also be hoping to provide support for Lee in the forward 50. Tesharna Maher and Jovanka Zecevic have been impressive in the back up, while a whole team effort will be required to get up in this game. North Adelaide should continue their winning ways of late, while for the Eagles, the power of breaking the winless drought is something that will keep them focused for the remainder of the season. WE are passing the midway point of the South Australian National Football League (SANFL) Women’s season as Round 6 gets completed over the weekend. Norwood hope to continue its unbeaten streak against Glenelg, while Woodville-West Torrens is the only side without a win, and face a tough task against South Adelaide on Sunday. The premiership favourites meet a side that has struggled to score in the past couple of weeks, in the first game of the round at Peter Motley Oval. For the Redlegs, they have answered every challenge thrown at them, and seem to be getting stronger as the season goes on, defeating West Adelaide by 63 points last week. Midfielder Rhiannon Busch returns to her side with Elisha Gallagher, while Sally Riley heads out of the team to prepare for Adelaide’s AFL Women’s Grand Final. The Tigers have brought in two players to the side that has not scored a goal since Round 3, with Ellen Fauser heading to centre half-back, while Milli Gentile has been named on an extended interchange bench. Since Glenelg’s third consecutive win – an impressive 15-point victory over North Adelaide – the Tigers have managed back-to-back games of just three behinds. With the Redlegs averaging 53 points per game in the past fortnight, both teams head into the game with very different form lines. Najwa Allen continued her fantastic season form last week, racking up 33 disposals to take her season average to 23.8, the league leader. Hannah Dunn has been equally as impressive finding the ball (19.6 disposals per game) with Monique Hollick not far behind (17). Norwood also has a versatile forward line without a sole dominant goalkicker given Allen (five goals) leads the team goalkicking. Glenelg’s Hannah Crump has booted four for the season but the scoring has dried up in the past two weeks. The battle within the battle will be between Norwood’s Leah Cutting and Glenelg’s Caitlin Gould who are one and two respectively in the hitout stakes, so getting first hands to the ball will be crucial. Gould also averages almost four clearances per game, the four most in the competition, just behind Redlegs’ Sophie Armitstead (4.2). Norwood will take strong favouritism into the game and look set to win its sixth straight match, while Glenelg will need to find an avenue to goal if the Tigers are to cause an upset. In the second game of the double header at Peter Motley Oval, Sturt is coming off its first win of the season, while West Adelaide sank to a disappointing defeat a the hands of the seemingly unstoppable Norwood. The Double Blues have had a rocky start to the season and their first win was an unconvinving two-point goalless win, but it was enough to get the points and now prepare for the rest of the season. Sturt has lost key player Georgia Bevan who will miss due to a wedding, while Zoe Prowse was injured last week. It will mean midfielders, Sophie Hoyle and Maya Rigter will have to shoulder more of the load in this game, while the return of Alex Ballard and Casey Fraser will sure up the defence, and Nicole Baker and Della Griffith‘s return will add some extra potency in attack. For the Bloods, they have made three changes with Kelly Whittaker returning to the side along with full-forward Megan Rich and Phoebe Edwards. West Adelaide will hope to look to Chelsea Biddell in order to get some early majors on the board, while Abbie Ballard and Maddie Newman will be crucial players in the team. Melanie Elsegood has been a rock in defence with Lauren Rodato, and the Westies defence will be keen to repel and set up forward attacks. For Sturt, they must win the midfield battle and get the ball inside 50 to create opportunities and try and get on the board if they are to go back-to-back in the wins column. West Adelaide is favourite for this clash, but Sturt will build on its confidence from last week to try and upset the Bloods here. Heading to the evening game, the red hot South Adelaide take on a Central District team that will be keen to get back on the winners list after losing last week following consecutive victories in Round 3 and Round 4. The Panthers have only lost to Norwood and are in fine form heading into the Round 6 clash to start incredibly warm favourites. They made light work of Central District last week with a nine-goal win after the Bulldogs got the jump of them kicking their only two goals of the game to start the game. The Panthers’ young brigade has been superb this seaon with Teah Charlton having a brilliant game last week courtesy of 24 disposals, five marks, a massive 16 tackles and three goals, while Hannah Munyard (20 disposals, five marks last week) and Montana McKinnon (equal second in hitouts so far this season) are consistently putting in strong performances. Tonia Filke is out of the Panthers side after doing her knee early last week, while four players have been added to an extended bench. The Panthers midfield is incredibly strong with Munyard, Nicole Campbell, Czenya Cavouras and Elyse Haussen able to control the midfield. Central District will be keen to get another win on the board this round, with Danielle Stewart (16 disposals per game) a key member of the side. With last year’s league leading goalkicker Katelyn Rosenzweig sitting in equal second, she will be the key to stopping the Bulldogs’ goals, while Charlton is just one behind Rosenzweig with seven majors thus far this season. Madison Bennett is one of many South Adelaide players who have got on the board this seaon, scoring three goals to be next behind Charlton. The Panthers are looking incredible at the moment and they will be a hard team to stop, and the Bulldogs will need to put on their best performance to cause an upset. The final game of the round is the streamed game with Woodville-West Torrens taking on North Adelaide in a huge clash at Maughan Thiem Kia Oval. With Sturt’s victory last week it leaves the Eagles as the only winless side remaining this season, while North Adelaide have had an up and down season and will look to consolidate against the cellar dwelling Eagles. Kiana Lee has been a shining light up forward for Woodville-West Torrens booting five goals, while Sarah Perkins has booted six in just three games with the Eagles. Woodville-West Torrens have swung the axe with five changes, including one forced change as the injured Taylor McKay is forced out of the side. Into the team comes crucial onballer Jaimi Tabb who was sorely missed last week, while Chloe Forby slots into the forward line and Ashlee Reid at centre half-back. The Eagles have had some top individual performers this season and are showing plenty of competitiveness, although their loss to South Adelaide was disappointing after a bright first 10 minutes. They will need to start strong against the Roosters and maintain that intensity if they are to record their first win. North Adelaide has lost Rheanne Lugg given the Crows’ have an AFL Women’s Grand Final to play on the same day, while midfielders Brittany Perry and Paige Allen return to the side, as does Ashleigh Woodland who has been named at half-back. Nadia Von Bertouch has been a ray of consistency this seasonwith the captain, full-forward and competition leading goalkicker Kelly Barltrop and centre half-back Amber Ward among the top players this season. North Adelaide should come away with the points in this clash after recording a nice win over Central District last week, but the Eagles have some crucial returns and can cause headaches up forward. IN the third round of the South Australian National Football League (SANFL) Women’s competition, Glenelg and Norwood remained unbeaten, while Central District picked up its first win of the season and South Adelaide bounced back with a victory. Glenelg: Madisyn Freeman 2, Hannah Crump, Tamsyn Morriss, Lucy Armitage, Samantha Franson. North: Kelly Barltrop 2, Lauren Daniel, Nadia von Bertouch, Paige Allan. In the opening game of the round, last year’s wooden spooners, Glenelg showed the opening two rounds were far from a fluke, knocking off preliminary finalist, North Adelaide in a 15-point win at City Mazda Stadium. In a high-scoring opening term, Norwood got on the board first courtesy of a goal from Lauren Daniel, before three consecutive goals to Glenelg had them hit the front by 12 points. Roosters’ leading goalkicker, Kelly Barltrop scored one more before quarter time to cut the deficit to six points, before Paige Allan leveled the score just two minutes into the second term. Madisyn Freeman booted her second of the contest shortly before Barltrop nailed her second and both sides were level at the main break. A goal each in the third term could still not split them, before Glenelg’s Rebecca Steer and Hannah Crump both made opportunities count in the last term to record an impressive win. Chelsea Packer was the highest ball winner for the Tigers, racking up 16 touches, four rebounds and two tackles, while Jordan Bardley (five inside 50s) and Lucy Bellinger (six tackles) both had 12 disposals. For North, Amber Ward had 15 disposals and four rebounds in the loss, while Nadia Von Bertouch laid five tackles from 14 disposals and booted a goal. Leah Tynan played an important role with seven tackles from 10 disposals and three inside 50s, while Adrienne Davis recorded four inside 50s as well as 14 touches. Next round after a bye, Glenelg hopes to make it four on the trot when they take on West Adelaide, while North Adelaide takes on reigning premiers, South Adelaide. Central: Katelyn Rosenzweig 3, Isabella Wilson, Chantel Reynolds 2, Abbey Scheer, Amy Fisher. Eagles: Sarah Perkins 2, Kiana Lee, Stephanie Walker, Rachel Dunstan. Central District gained the early bragging rights between the league’s two newst sides, running out 28-point winners over Woodville-West Torrens. Both sides headed into the game with two consecutive losses under their belts, but it was the Eagles who struck first blood. A goal to Kiana Lee resulted in the visitors taking an early lead, before Bulldogs Isabella Wilson and Katelyn Rosenzweig booted goals before the first break to lead by six points. The Eagles missed a number of opportunities in the second term and Central District made them pay, with Tara McDermott, Sarah Perkins and Kiana Lee (the latter two twice) all missing opportunities. Wilson and Rosenzweig both scored majors, as did Chantel Reynolds, while Perkins kicked the Eagles’ only goal of the term to trail by 13 points at the main break. Central District went on with it after the half, as Amy Fisher, Reynolds and Rosenzweig all capitalised, though they also missed a number of opportunities in the scorching heat, but took a 33-point lead into the final break. Goals to Rachel Dunstan and Perkins early in the fourth quarter cut the deficit to 22, but Abbey Scheer snuffed out any chance of a comeback with an important goal as the Bulldogs ran out comfortable winners. The Bulldogs shared the ball around with no-one dominating possession as Scheer and Danielle Stewart both recorded 13 touches. Stewart also had four inside 50s, three rebounds and five tackles, while Gemma Doughty was strong in defence with five rebounds. Alicia Butler laid a team-high seven tackles from her nine disposals. Stephanie Walker was the Eagles’ highest ball winner with 18 disposals, seven inside 50s and two rebounds, while Jaimi Tabb was prolific again with 15 disposals, five inside 50s and five tackles. Lee and Perkins were the key targets but missed some opportunities, booting 3.5 between them. After the bye, Central District hosts the winless Sturt in a chance to go back-to-back wins, while Woodville-West Torrens faces premiership favourites Norwood. Norwood: Emma Clark, Jo Hill, Monique Hollick, Najwah Allen, Kate Fenton. Sturt: Sophie Hoyle, Lauren Lovell, Lane Trenorden. Norwood did what many expected the Redlegs to do, but not without a fight. The undefeated side took on the winless Double Blues, but found themselves 12 points down early following goals from Sophie Hoyle and Lane Trenorden. Jo Hill booted a late major for the Redlegs to cut the deficit to four points at the first break, then Monique Hollick made it count midway through the second term. Lauren Lovell booted on on the edge of half-time for the Double Blues to hit the front, but only by a point at the main break. The second half belonged to Norwood as the Double Blues could only boot five behinds as Kate Fenton, Emma Clark and Najwa Allen all converted opportunities to run over the top of Sturt and remain undefeated from three rebounds. Sophie Armitstead had 19 disposals, nine tackles, four inside 50s and two rebounds, while Hollick was busy with 17 touches, six tackles, four inside 50s and a goal. Leah Cutting was dominant once again in the ruck with the former basketballer amassing 28 hitouts and six tackles from nine disposals, while Alison Ferrall and Rhiannon Busch were vital in the back half with a combined seven rebounds. For Sturt, Hannah Prenzler recorded a team-high 14 disposals as well as two inside 50s, four rebounds and four tackles, while Alex Ballard and Lucy Griffith both had 13 touches. After next round’s bye, Norwood hosts the winless Eagles, while Sturt hopes to break its winless drought against Central District. South: Indy Tahou 2, Teah Charlton, Danielle Goding, Hannah Munyard, Madison Bennett. West: Chelsea Biddell 2, Melanie Elsegood, Emma Smith, Zoe Venning. In the final game of the round, reigning premiers South Adelaide showed their class with a 16-point win over West Adelaide. The Bloods headed into the game undefeated having knocked over the two new clubs of the competition, and leading goalkicker, Chelsea Biddell booted the opening goal of the game to give the visitors some hope. Indy Tahau, Madison Bennett and Mykala Walker-Murphy all booted goals heading into the first break to take a 12-point advantage into quarter time. Melanie Elsegood was quick to get West Adelaide back on the board early in the second term, but Danielle Goding scored in the dying minutes to re-extend the lead back to two goals. By the final break West Adelaide showed they were up for the fight thanks to goals to Emma Smith and Zoe Venning to draw within eight points at three quarter time. When Biddell booted the first goal of the fourth quarter to give the Bloods hope, the reigning premiers found an answer in Hannah Munyard and Indy Tahau who both found the big sticks and resulted in the Panthers recording a solid victory over much improved opposition. Panthers big ball winner, Czenya Cavouras had 10 more touches than anyone else in the competition on Friday, racking up 29 disposals as well as 10 tackles and five inside 50s. Teah Charlton (19 disposals, three tackles and two inside 50s) and Nikki Gore (19 disposals, six tackles and three inside 50s) were also productive, while Montana McKinnon continued her good season in her top-age year with 23 hitouts from 14 disposals, seven marks (a massive five contested), two tackles and two inside 50s. Abbie Ballard was the top disposal winner for the Bloods with 18, also recording six tackles and three inside 50s, while Rebecca Owen (16 disposals, four marks, four tackles, two inside 50s and three rebounds) and Madison Newman (13 disposals, two tackles, three inside 50s and four rebounds) were also impressive despite the loss. After the bye, South Adelaide takes on the Roosters, while West Adelaide hosts the undefeated Glenelg. THERE is no greater build up for this year’s Grand Final. Southern Districts outworked Palmerston and the reigning premiers smashed their old rivals, Darwin. This weekend Waratah will look to win back to back premierships, while the Southern Districts will play their first Grand Final in NTFL Women’s history. During the home and away season, the Southern Districts met the Pies twice and lost twice. This time was different as they raised their intensity to block the superior speed of Palmerston and win the game. The Magpies drew first blood, but the Crocs quickly responded through Kelsey Patterson and Lateesha Jeffrey who snuck forward. Ebony Miller was controlling the hit-outs, but Jessica Stassi kept finding the ball despite the ruck dominance. Shenaida Bush struck back for the Pies by booting a goal late to finish the first term. Down back, Billie Byers was impressive with her run and carry, as she ran around seemingly unchecked by her opposition. However, on the other side of the field, Tayla Thorn was the difference for the Crocs. Thorn’s clearance ability and second efforts at the contest were second to none in the Districts back line. The second quarter saw a great pack mark by Michaeline Brown inside attacking 50. Dead in front, she made no mistake extending the Pies’ lead to seven points. The Crocs answered quickly as Miller took a mark 40 meters from goal. Miller had no problem making the distance, her goal ending the term. Freda Puruntatameri had been busy for most of the game, but in the premiership quarter she gave Palmerston a touch of magic with a pack mark in the goal-square to kick her first goal of the match. The Crocs bounced back with a quick snap by Patterson, but Puruntatameri kicked an inspirational goal off the burst to head into the final quarter. The Pies had a five-point buffer but Southern Districts would not be denied. Thorn, Rhiannon Busch, and Charles Deegan were chucked into the centre of the ground. It was the smartest move for the side, as the trio proved their skill in the competition. The clearances and tackles were dominated by the Districts, while the Magpies seemed to be running on empty fumes. Patterson kicked her third to put the Crocs in front, but it was Tayla Thorn’s booming goal that put the game beyond doubt. Tahlia Holtze ended the game with a free kick after the siren to end the well-fought victory for the Southern Districts. Waratah: A. Chittick 4, J. De Melo 2, S. Prunntatemeri, S. Nalder. Darwin Buffettes: M. Roberts 2, M. Breed. A game of missed opportunities and bad mistakes saw Waratah walk away comfortable winners over Darwin. The game opened up with Machaelia Roberts kicking the first, pushing into the forward line and making an immediate impact. Waratah hit back but only managed four behinds due to inaccuracy. Lisa Roberts was sent to defense, proving a class above the rest with her intercept marking and disposal efficiency. Kylie Duggan, on the other hand, was working hard around the ground. Duggan seemed to be working overtime again for the Buffs, getting plenty of the ball early. Jade de Melo broke the ice for the Warriors, booting their first goal. Amy Chittick was soon to follow with her first to end the term. Darwin began the second quarter with a positive start. Nicolette Dunn kicked her first goal for the Buffs, keeping her team’s momentum up. It was quickly shattered when Zoe Anderson missed the perfect opportunity to run into an open goal and put the Buffs in front. Waratah responded in kind with Sue Nalder kicking her first for the day, before Sherayn Paruntatameri was next to extend the margin to 17 points and end the first half. Machaelia Roberts lifted her team in the third quarter by booting the first goal of the term. Mattea Breed was next to snap a goal for the Buffs, bringing the deficit back to 10 points. Unfortunately, Amy Chittick had an instant response for Waratah, kicking two majors. De Melo would add to Darwin’s pain kicking her second, followed by Chittick booted her fourth shortly after, meaning Waratah headed into the final quarter with a heavy lead. Only one behind was scored in the final quarter as both teams were out on their feet. Waratah simply proved too powerful for the Buffs, and will now head into their seventh consecutive Grand Final. THIS week’s semi-finals will undoubtedly see the best of the best duel one last time before the ultimate battle. Palmerston’s loss against Waratah was painful, but now they face the Southern Districts. The Pies have beaten the Crocs twice this season, but the Crocs are coming off a high after smashing the Saints. In the afternoon, Waratah will meet Darwin for another classic bout. The Warriors are heavy favourites for this match, and with the Buffs’ extended injury list, it is easy to see why. Southern Districts somehow find themselves in St Marys’ shoes at the moment, having met Palmerston twice this season and lost on both occasions. For the Crocs to win they must use every opportunity and advantage they have to deny the Pies the ball. the Districts’ first advantage lies in their ruck stocks. Ebony Miller and Indy Sleeth will make sure their hit-outs give their midfielders first use of the ball. Meanwhile, Jessica Stassi and Natasha Medbury will help to control the clearances. If things get dire, Miller and Sleeth can simply punch the ball forward to gain ground. Crocs forwards must put Billie Byers inside 50 or she will rebound the ball like it was never there. If Tayla Thorn can get off to the start she had last week, it may set the perfect foundation for the Districts to rise from. Rhiannon Busch is a proven goal kicker and has had a stellar couple of weeks, while Charles Deegan, though recently getting extra attention from defenders, is always dangerous around goals. On the other side of the field, Shenaida Bush and Freda Puruntatameri are starting to click. This could prove very damaging to the Crocs as both are very quick and deadly accurate. Lateesha Jeffrey and the Districts backline will have a tough task keeping this pair quiet. If they can, it could prove the difference between victory and defeat. Palmerston will walk into this match favorites, but Southern Districts may give the Pies a shock in this heavyweight bout of the Semi-Finals. 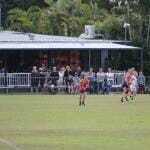 Darwin’s tactics last week may have beaten Pint, but it will not do against Waratah. The Warriors have 15 premiership players returning for this match and no amount of waiting this team out will help the Buffs. The Buffettes have to go for broke and, missing key players in the midfield and forward line, they may have to mix it up. If Dominique Carbone starts in the centre of the ground, it will free up Machaelia Roberts to push forward. Darwin’s forward line looks completely different when Roberts has the opportunity to cause defenders headaches. This leaves Carbone, Jemma Iacono, and Kylie Duggan to tackle Lisa Roberts, Madeline Gault and Alysha Healy in the midfield, which could go either way. The Buffettes cannot allow Waratah to dominate the clearances. Amy Chittick is the league’s leading goal kicker and now has Lauren O’Shea for assistance. If the Warriors’ forwards get a taste of blood, they will swarm the Buffs’ backline and devastate the scoreboard. Waratah also has a player similar to Roberts in Sherayn Puruntatameri. She pushed out from half-back last week to bag three majors. Puruntatameri is an X-factor player, which makes her a difficult match-up for Darwin. Celina Whan might be the Buffs’ best choice for Puruntatameri if she plays down back. Waratah could easily turn this into an ugly game, but perhaps the rivalry will spur the Buffs to challenge the champions. THE opening round of the South Australian National Football League (SANFL) Statewide Super Women’s League is completed tomorrow with four games across two double headers. Two new sides – Central District and Woodville-West Torrens are making their league debuts, while reigning premiers South Adelaide begin its campaign to go back-to-back. The opening game of Round 1 for the 2019 season sees last year’s wooden spooners taking on one of the new sides of the competition. Woodville-West Torrens will hope to kick off their SANFL Women’s League campaign with a win against Glenelg, who have won four games from their 16 matches played. With plenty of changes at the Tigers, and a number of experienced players departing the club, Glenelg will hope the likes of Morphettville Park duo, Chelsea Packer and Ellen Fauser can step up and help new coach, Jason Fairall gain an early win for season 2019. The Tigers won three of their first four games in 2017, but have won just one game since March, 2017 which was a five-point victory over West Adelaide. With the two new teams up first, the Tigers hope to start their 2019 campaign like they did in 2017. Tigers’ captain, Cass Hartley, vice-captain Elle Hellock, Sheridan Howell and Bonnie Wells are the only four players on the list who played all 10 games last season. Last year’s leading goal kicker, Lexia Edwards retired and the visitors will hope to find a new target in attack this season. The Eagles are harder to gauge given they are a brand new team to the competition, but coach Tess Baxter has brought in some seriously talented youth, which means one can expect they will have plenty of run in their legs. Jaimi Tabb – who booted five goals for West Adelaide last season – and Rachel Dunstan have both headed to the Eagles, while former GWS GIANT, Stephanie Walker looms as the key player in the side. Add in Kiana Lee and the young Eagles will challenge plenty of teams. Two of the original SANFL Women’s League sides, Norwood and North Adelaide clash for the seventh time in the clubs’ histories, with Norwood holding a 4-2 win-loss record against the Roosters. The Redlegs have a premiership in the bank having defeated their Round 1 opponents in the inaugural grand final, before going down to South Adelaide last year. 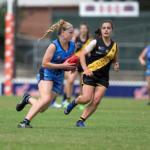 Norwood have bade farewell to a number of players who have left to play AFL Women’s or VFL Women’s competitions. They need to find a way to replace GWS GIANT, Ebony O’Dea who was drafted last season, however Monique Hollick and Rhiannon Busch – who combined for 293 possessions in season 2018 – will be looking to start off strongly this season. The Redlegs’ lowest score in their history came against North Adelaide last year when Norwood failed to score, but two other wins – including the preliminary final victory – meant they ended the year with a positive win-loss ratio. For North Adelaide, the loss of former captain, Jess Edwards, young ball winner, Esther Boles and Adelaide AFL Women’s players, Katelyn Rosenzweig and Chloe Scheer who were both rezoned, means like the Redlegs, the Roosters will have a vastly different line-up. With GWS GIANT, Britt Perry also out for most of the season, the Roosters will look to assistant coach Emma Sampson who has returned to the playing field, as well as a host of players stepping up to the league. Paige Allan, Kelly Baltrop, Lauren Daniel, Sarah Ellis, Nadia Von Bertouch and Amber Ward all played every game last season and provide some consistency across the field. The Round 1 clash between South Adelaide and Sturt is the third time the two teams have clashed, with the Panthers emerging victorious on both previous occasions. Both new teams to last year’s competition, South Adelaide triumphed in Round 2 by 46 points and Round 8 by a thumping 86 points, en-route to the 2018 premiership. Sturt used the third last game of its season to turn the form around, upsetting eventual grand finalists, Norwood by six points, then backing it up with a win over wooden spooners, Glenelg by 16. The Panthers have a number of talented young players who have the potential to cause damage to their opposition, including top-age Under-18 South Australian ruck, Montana McKinnon, and Under 18 representatives from last season, bottom-ager Teah Charlton, now top-ager Hannah Munyard, and Madison Bennett and Jaslynne Smith. Elysse Haussen was one of the more prominent ball winners for the Panthers last season, averaging 15.3 possessions per game, third behind the departed Nikki Gore (19.5) and Czenya Cauvorous (17.3). For Sturt, they have regained Georgia Bevan for the full season after the Crows’ AFL Women’s player averaged 16.8 disposals last season from four games. Once the AFL Women’s season is over, the return of Jess Foley will be handy having averaged 18 touches from her nine games for the Double Blues. Sturt’s test will be finding targets up forward, with Becchara Palmer heading interstate leaving Shae Gundlach as the sole leading goal kicker from last season, having booted four majors. South Adelaide will head into this game as strong favourites, but it will be interesting to see how they shape up. In the final game of the round, West Adelaide hosts Central District in the Bulldogs’ first ever SANFL Women’s League game. Last season the Bloods finished just outside the top three, and will be keen to get an early win over the newcomers to the competition. They have some seriously talented young players at the Westies, with Rachelle Martin impressing for South Australia at the AFL Women’s Under 18 Championships last year, and proving herself to be a ball magnet in this competition, averaging 18 disposals from her 10 games. With older sister Hannah drafted by the Crows, Rachelle will be keen to put in another great season and follow in her footsteps down the track. Abbie Ballard is another player to watch out for as the bottom-ager has shown plenty of talent in her career at the level, and could take her game to the next step ahead of the 2019 AFL Women’s Under 18 Championships. Add in top-ager, Maddi Newman and a couple of basketball recruits in Leah Swain and Alice Gee, and the Westies have some potentially untapped talent. Looking at the Bulldogs’ list, no doubt the club will be carefully monitoring Adelaide’s AFL Women’s team selection since securing Chloe Scheer and Katelyn Rosenzweig from North Adelaide. While Scheer is now seemingly a lock inside Adelaide’s best 22, Rosenzweig is yet to be selected, although many expect a debut not too far away. Last year’s leading goal kicker in the competition would be a huge target inside 50 for the Bulldogs. Former netballer, Nicola Biagi has been named as captain and is a testament to her impact off the field over the pre-season for her to lead the club in 2019. While how Central District performs is a bit of an unknown, they did win a couple of practice games over the summer giving them hope they can match it with the sites this season. 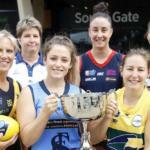 IN 2019, the South Australian National Football League (SANFL) Statewide Super Women’s League will feel fully complete for the South Australian fans with the introduction of the final two non AFL-aligned clubs in Central District and Woodville-West Torrens. The Bulldogs and Eagles kick-off their 2019 campaigns with the other six clubs on Friday night with double-headers at Flinders University Stadium and City Mazda Stadium. We take a look at how each of the eight teams went last year and who might influence their campaigns in 2019. The first of the new clubs entering the SANFL Women’s League in 2019 has had no trouble bringing in some young AFL Women’s talent, with Crows’ pair, Katelyn Rosenzweig and Chloe Scheer both joining the club from North Adelaide. While Scheer was recovering from injury last year, she is no stranger to league best and fairest awards and when the AFL Women’s season is over, expect her to have a big impact. Rosenzweig won the league goal kicking last season, and is yet to be named in Adelaide’s best 21, although there is little doubt she will squeeze her way in there soon. They also picked up Jayme-Lee Sonnerman from West Adelaide who will join the pair in the forward line after three goals in two matches last year, while fellow former Bloods player, Shannen Solly managed six matches, named in the best twice. Sonnerman will play alongside sister, Demi who also lands at the Bulldogs. Three cross-coders in netballers, Nicola Biagi – who has been named inaugural captain – Taryn Wills, and cricketer, Sarah-Jane Jameson join the side in what will be a largely unknown team outside the top couple of Crows’ stars. The bottom-placed side last season will be keen to build on their performance, but will need to find a way to cover for the injured Angela Moritz. The assistant coach has undergone a knee reconstruction and will miss the season, which will hurt the Tigers considering her impressive performances last season. Moritz joins Sam Allan in recovering from a knee injury, while Brianna Walling has headed to the sunshine state. The trio combined for a total of 19 times in the club’s bests last season, and with leading goal kicker, Lexi Edwards retiring the Tigers will have to fill the holes left by the departing experience. They do have renewed enthusiasm with Jason Fairall taking the reigns at the club for the 2019 season. Given the loss in experience, the Tigers will hope the likes of Morphettville Park duo, Chelsea Packer and Ellen Fauser will help spur the side back up the ladder. While last year’s season ultimately ended in heartbreak with an eight-point loss to Norwood in the preliminary final after finishing second on the home and away season ladder, the Roosters would be thrilled with the amount of talent that reached AFL Women’s level. Former leader, Jess Edwards went to Carlton, Ashleigh Woodland landed at Melbourne, Brittany Perry became a GIANT, and talented forward duo, Katelyn Rosenzweig and Chloe Scheer were recruited by the Crows. With the latter two rezoned to Central District, all of those players will be unable to pull on a North Adelaide jumper in 2019, much like state under 18s captain, Esther Boles who is taking a chance with Richmond’s VFL Women’s side in a bid to be picked up by the Tigers ahead of the 2020 AFL Women’s season. The ins do not match the outs in terms of SANFL Women’s experience, with the exception of Emma Sampson, the assistant coach who has opted to pull on the boots again. Among the inclusions are Andie Zbierski and Amy Reid, while netballer, Elysha Willis is taking a chance on football. In 2019, the Redlegs made a huge run to push South Adelaide all the way in the decider, falling five points short of a premiership. Ebony O’Dea heads the departures after she was recruited to the GIANTS’ AFL Women’s side, and four players – Tess Baxter, Adele Gibson (playing eight games in 2019), Aajiah Jerico and Georgia Taylor – all headed to new club, Woodville-West Torrens. Key players Nicole Campbell and Alana Browne have crossed to reigning premiers, South Adelaide while Nicola Burns has headed to Victoria to try her luck with Carlton’s VFL Women’s side. It means the likes of Monique Hollick and Rhiannon Busch will be among plenty of fresh faces when they kick-off this Friday. Adelaide’s Sophie Armitstead has joined the club and will be available when not selected, while former GIANTS, Hannah Dunn and Najwah Allen will fill the voids left by some of the departing players. Morphettville Park trio, Erika Sporn, Thalia Meyer and Hannah Priest will also be keen to impress in the step up in competition. New Panthers’ coach Rick Watts will lead a vastly different team to the one that Krissie Steen lead to a premiership last season, with a number of players recruited into the AFL Women’s and testing themselves in the VFL Women’s. Young gun, Nikki Gore was recruited by the Crows after another sensational season last year, while Lisa Whiteley joined the GIANTS. Versatile tall, Kristi Harvey opted to stay in Victoria with Carlton’s VFL Women’s side, joined by Jorja Rowe and Louella McCarthy. The Panthers should not be taken lightly however, with Norwood duo, Nicole Campbell and Alana Browne joining the club, as did promising bottom-age junior, Teah Charlton. Cross-coders, Jess Kirk (soccer) and Emma Gryczewski (netball) add an element of the unknown, while the expected inclusion of Courtney Gum late in the season could be huge in the Panthers’ hopes for back-to-back flags. Anne Hatchard, Cheyenne Hammond and Elyse Haussen remain at the club and will be as hungry as ever to repeat the success of 2018. The big inclusion for last year’s fifth placed side is Georgia Bevan, with the Adelaide AFL Women’s player signing on for the Double Blues and named co-captain with Caitlyn Swanson. Bevan replaces fellow young talent, Rachel Dunstan who has headed to her home club, Woodville-West Torrens now the Eagles have a side in the competition. Jess Foley has been a crucial player for Adelaide already in the ruck this AFL Women’s season and will be sorely missed by Sturt supporters, while Becchara Palmer has headed to New South Wales. Sturt is relatively untouched in terms of departures, with a number of inclusions from across the state, including Zoe Prowse, Isobel Kuiper and Hannah Dreckow. Bottom-ager Alex Ballard – sister of Gold Coast’s Charlie – will be one to watch over the next couple of years. West Adelaide is a side that has been relatively quiet over the off-season, picking up a few players, while a number departed to various clubs. Hannah Martin‘s recruitment to AFL Women’s is a big loss for the Bloods, while sister, Rachelle Martin will be keen to drive the team forward to improve on its 5-5 win-loss record from 2018. Fellow youngster, Jaimi Tabb has headed to new club, Woodville-West Torrens, while Taylah Gordon has joined St Kilda’s VFL Women’s side in the hope she can move through the ranks to AFL Women’s when the Saints join the league in 2020. Sophie Armitstead (Norwood) and Shannen Solly (Central District) are others who have departed the club, while South Adelaide’s Helen Maidment and basketballers, Leah Swain and Alice Gee also head to the Westies. Teenager, Abbie Ballard is expected to have a big impact in season 2019 as she develops, while Chelsea Biddell and Allison Evans will be keen to recreate the form they showed in 2018. The other new side in the 2019 SANFL Women’s League is Woodville-West Torrens, a side which targeted youth for its upcoming campaign. South Australian Under 18s vice-captain, Rachel Dunstan joined the Eagles, as did fellow Central Allies’ representative, Jaimi Tabb, and up-and-coming talent, Kiana Lee. Adele Gibson leads a list of four players who have crossed to the Eagles from grand finalists, Norwood, while former GWS GIANT, Stephanie Walker headlines the club’s recruits. The Eagles recruitment staff have gone outside the box in forming the side, also looking to ice hockey player, Tash Farrier and Mount Lofty’s Maddie Dufek. Both Gibson and Farrier have been named to lead the club in season 2019, with inaugural coach Tess Baxter knowing what it takes to reach the final game of the season having done so as an assistant at Norwood. 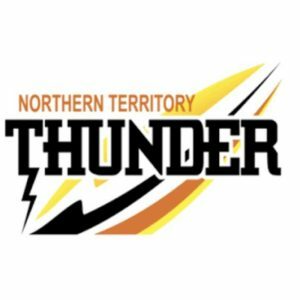 ROUND 17 is here and with only two weeks to go in the competition, Northern Territory Football League (NTFL) fans are in for a treat. Palmerston is arguably the in-form team of the competition and after St Marys’ heavy loss last weekend, the Pies will walk in heavy favourites. The main event will follow when the Southern Districts meet Pint in a test to see if the Queen Ants can push the Crocs to their limit. On Sunday another intriguing battle will ensue with Nightcliff coming up against the Wanderers. It will be a battle of pride between the two teams and should prove entertaining for die-hard fans who need a win. Lastly, Tracy Village will host Waratah at home. Waratah has been the unstoppable machine for many years and it looks like history is about to repeat itself. It was a tough pill to swallow for St Marys as they were performing very well up until last week when they got fed to the Crocs. They will face an even tougher adversary in Palmerston who have an elite squad of young talent. Billie Byers has been a revelation down back, as Tabitha May continues to dominate the Pies midfield while Freda Puruntatameri has become an elite goalsneak. On the other side of the coin, Alana Coombes is no slouch, nor Katherine Dann up forward. However, the loss of Danielle Ponter has left a huge hole in St Marys’ midfield. This is the area of the ground where the Magpies are the complete opposite, with Natasha Medbury and Jessica Stassi likely to prove to be a handful when the game starts. The Saints will need to produce their best to win, but nothing is impossible. Pint has hit their strides at the right time, but this week will face the Crocs in a match that should test the Queen Ants. Southern Districts has found a new spearhead in Rhiannon Busch who bagged four majors last week. But she was not alone as Tayla Thorn and Tahlia Holtze combined to destroy St Marys’ defense. Pint’s backline gun Erin Hetherington will need strong support from her fellow defenders to stop the trio. Defence is not the only concern for Pint, as the Crocs have a unique duo that feeds their rovers well. The ruck combination of Indy Sleeth and Ebony Miller gives the Crocs another huge advantage in this match. In order to negate this, Cassie Henderson, Samantha Barnett, and Samantha Freeman may need to shark the hit-outs and take control of the centre. If they accomplish this, the door will open up for forwards, Emma Greaves and Danielle Saddaby. There is no finals on the horizon for either of these teams in the coming weeks, with both sides struggling this season. Last week the Wanderers accepted an exhibition match to play against the Central Australian Pinktails. They were overwhelmed as the future talent shone against the Eagles. The Tigers were no different against against reigning premiers, Waratah. This is easily the most even match of the round, with the skill level of both sides seeming to be at a similar level. Arthurina Moreen has been the go-to forward for the Eagles, and could be in for a day out if her team can get the upperhand. Kristy Irvine and Zhoe Clarke should take a bow, as even in poor circumstances they have battled consistently through wins and losses. They are without a doubt the true champions of Tracy Village. Waratah, on the other hand, has no shortage of champions. Lately, however, a trio of Warriors forwards have become the ultimate scoreboard contributors. Lisa Miceli, Amy Chittick, and Lauren O’Shea are all ranked in the top three goal kickers of the league, each tallying a minimum of 18 goals – in reality, they are every defender’s worst nightmare. Tracy Village’s backline will be in serious strife if Waratah gets a rhythm going. THERE were a lot of twists and turns in round 16, with the latter end of the season proving very intriguing. The first match saw Darwin pull a 180 in effort and fall to Pint. The Queen Ants have now cemented their spot for finals by showing the Buffs that they are for real. The next match was no upset for Waratah, who stormed through Nightcliff with little effort. The Palmerston Magpies were no different, sweeping through Tracy Village with ease to continue their premiership campaign. St Marys was last to fall, the Southern Crocs were hurt from their last defeat and gave the Saints a death roll. The Crocs are looking forward to making a statement ahead of their first women’s finals appearance in history. How the mighty have fallen, with Darwin falling to St Mary’s and now Pint over the past few weeks. However, credit to Pint who jumped on the Buffs early and took them by the horns. The Queen Ants may not have kicked a goal after the second quarter but their defensive- efforts proved more than enough for Darwin. Erin Hetherington and her fellow backliners deserve a pat on the back, but for the Buffettes, the pressure is seeming to mount as we reach the end of the season. Celina Whan was the only Buff that could hold her head high as many Darwin stars went missing. Midfielder Tekesa Docherty-Cole was well contained by the Queen Ants, while the promotion of Jordann Hickey to the Melbourne Demons has left a huge gap in the backline. Elsewhere the Queen Ants are crawling over the competition but will meet a savage outfit in the Southern Districts this week. In two weeks the nightmare for the Tigers will be over and they can start rebuilding for next season. Unfortunately, they had the misfortune of playing the reigning premiers late in the competition. Amy Chittick kicked a bag for the Waratahs in the absence of spearhead Lisa Miceli. Tall timbers Lauren O’Shea and Molly Cooper combined for four majors while Sharona Bishop, Breanne Martin, and Alysha Healy dominated the midfield. Waratah will again look to continue an onslaught performance when they meet Tracy Village this Sunday. An honest start from the Razorbacks saw them become a bacon buffet for the Magpies. Freda Puruntatemeri lit up the forward line with Michaeline Brown, with the pair managing five majors between them. Billie Byers was again steady in defense thanks to an impressive midfield, with Tabitha May being the stand-out. The Magpies have indeed become the heavy favourites to take home the cup this season after becoming the premiership fancies of the competition. Palmerston’s final rounds will see them face St Marys and the Wanderers, projected wins that are likely to give the Pies a huge advantage as they cruise into finals. After a poor performance in their previous match, the Southern Districts had one thought on their mind: crush the Saints. The Crocs were awake this week and showed the competition that last week was just a hiccup. Rhiannon Busch was star of the show, kicking four goals for the day. Tayla Thorn was close behind, running St Marys into the ground. Lateesha Jeffrey owned the backline, teaming well with Indy Sleeth as she controlled the ruck. This game showed how dominant Southern Districts can be on the scoreboard. Pint is up next for the Crocs, so they will be hungry to beat a team in form.